Socionomics Institute Director Mark Almand interviews MTA member and founder of the Socionomics Institute, Robert Prechter. Mark Almand: Socionomics seems to be gathering steam. You have a monthly publication called The Socionomist. In addition to the two you wrote, three books about socionomics have now been written by others and published, including Peter Atwater’s “Mood and Markets” this year. Five academic papers are now in print, your annual socionomics summit is on its third year, you and others have presented socionomics at the world’s most prestigious universities, and a handful of professors have taught socionomics classes. Even the media is getting aboard with coverage of your recent Elections study. You must be pleased. R.P. : I always feel that it’s taking too long for people to discover socionomics. But when I review the latest developments, I realize that progress is coming along nicely. So thanks for the reminder. For the benefit of new readers, how about an “elevator speech” definition of socionomics? Socionomics is the study of social mood and its consequences in social action. What’s the hardest thing for most newcomers to grasp? That social mood motivates social actions instead of the other way around. Can you give me an example of how this causality works? There are millions! Here is one: Most people think that recessions make businesspeople cautious. Socionomics says the opposite: Cautious businesspeople make recessions. So, the mood is the cause, and the event is the result. Why is this insight important? What can it do for people? Start with the above example. If you grasp that social mood is what moves the economy, and you can measure mood, then you can identify when and where recessions are most likely to occur. You can get out of the way. And socionomics says that you can measure mood via the stock market? Yes. For a variety of reasons, the stock market is an excellent meter of society’s mood. People can act on their moods immediately by buying or selling stock. But decisions they might make at the same time to expand or contract a business, or to draft a peace treaty or declare war, take time to effect. So there is a lag. This is why the stock market predicts the character of news, not the other way around. How did you first realize that socionomics is a force in society? I was working for the Merrill Lynch Market Analysis Department. I studied the Wave Principle, cycles and technical analysis and watched the stock market confound the fundamental analysts time and again. It became obvious to me that news lagged prices, not the other way around. So I became committed to the idea that the market moves independently of such outside events as elections, the Fed, interest rates, economic news and social events. I realized that those events have no predictive value as far as the stock market is concerned, at least not in the way most people read the news. When did you start writing about socionomics? In 1979, I went independent and started a publishing company. In December that year I wrote my first socionomic declaration. It’s at the start of Pioneering Studies. In 1984 I wrote another one. Then in 1985, I wrote a report titled “Popular Culture and the Stock Market,” which was boiled down for a Barron’s article. That sort of kicked things off. Then a small segment of the public got interested. Were you a pure socionomist from the start? Socionomics is deeply counter-intuitive. I had to go through a long process of weeding out misconceptions from my mind that had taken root there long ago. An early example was the idea that interest rates buffet the stock market. Economists are sure it’s true. My colleagues were convinced of it. It makes sense. It’s also quite wrong. If someone told you the course of interest rates in advance, you couldn’t predict stock prices. The stock market moves on waves of social mood. If you know that, you know more than the person who knows where interest rates are going. And, of course, no one knows where interest rates are going. Except that sometimes socionomists do know, because we study the history of waves and their attending social attributes. What was the next big insight? By 1999, I had become an almost complete purist. I was able to turn every exogenous-cause argument on its head: prove it was wrong, and then show that socionomic causality successfully explains the very same data. But I still had this residual belief, carried from the past, that the Federal Reserve had the power to control the money supply and thereby move markets around. One day I realized that this idea, if it were true, challenged the whole socionomic model. I posed the same question I always did: When I reverse the order of causality, how does it re-form the question? So instead of asking how the Fed controls the markets, I asked how the mood behind the market controls the Fed. I discovered that people create central banks at certain times in the wave structure. I plotted interest rate data and realized that the Fed just follows the T-bill rate, which is set by the market. I studied the Fed’s historical actions and realized that the Fed does not act; it reacts. The whole Wizard of Oz image went up in smoke. That was my last bout with exogenous causality. Oh, yes. This specific exercise proved very useful, because it led me to an understanding of credit and the Fed that allowed me to write a unique book predicting deflation. I am sure that along the way, you had several additional major breakthroughs. What were the key one or two? Well, I had to tie all my ideas together theoretically. For one thing, I realized that the causality attending economics and finance are completely different. This is also an idea that, as far as I can tell, no one had proposed before. I wrote about it with Wayne Parker in a paper for the Journal of Behavioral Finance in 2007. Has anyone ever shared an “aha moment” of their own regarding socionomics with you? A number of people have come up with valuable insights about socionomics. Wayne Parker proposed a metatheoretical context for the theory, which was very important. Also, Wayne and I collaborated to come up with the distinction between mood and emotions. Alan Hall and I figured out that the center of wave 3 is the mood-direction delineator, an idea that we wrote up for The Socionomist. Other people have done some excellent supportive studies. Pete Kendall showed how the sport of basketball has grown and contracted in concert with social mood, and he has linked the outbreak of fighting in the Middle East with worldwide social mood peaks. Working from a suggestion from Pete Kendall, Professors John Nofsinger and Kenneth Kim demonstrated a strong relationship between stock market trends and the timing of when the government adds and removes regulations on investing. Mark Galasiewski connected stock market trends to the popularity of automobile colors; DuPont included it in its annual Automotive Color Popularity Report, and Radar magazine wrote it up. And Brian Whitmer used socionomics to predict the Greek debt crisis and a coming breakup of the European Union. There must be three dozen such contributions. When Brian published his report, the media said nothing. There was no interest. Then a few months later when the Greek debt crisis occurred, it was a bit late to take action. This kind of thing happens regularly, doesn’t it? Socionomic insights are their most useful precisely when most people are least inclined to pay attention to them. It is unfortunate and ironic, but socionomic theory explains why it is also axiomatic. You also mentioned mood versus emotions. What is the difference? Emotions are exogenously referred, consciously experienced feelings, regulated by a combination of mood, conditions and events. Mood is an endogenously regulated, unconsciously experienced mental state, regulated by Elliott waves. Mood predisposes people toward certain emotions. But before a person can experience an emotion, he must have a referent. People in a positive mood trend might credit a political leader or a musical group for their happy feelings. People in a negative mood trend might blame a political leader or their spouses for their unhappy feelings. So unconscious moods can produce conscious emotions via an external referent, but the root cause—mood—goes unrecognized. Which brings me to another point. People have no capacity to remember their shared moods. They do remember emotions, however, which are expressed with reference to exogenous circumstances. You said people cannot remember their moods. Is that because mood is unconscious? Exactly. People will remember a powerful emotion their whole lives. For example, if you ask them how they felt when their child was born or when a beloved pet died, often they can tell you. But if you ask them how they felt at the last market top, they have forgotten it already, and they think that any fool should have seen it was a terrible time to own stocks! Clearly the brain has no storage mechanism for social mood. It exists only for the moment. It fluctuates in a fractal pattern. People sense it unconsciously, so they don’t recognize it, which is why they don’t remember it. If I understand the concept of a “fractal” properly, mood can be in a negative and positive trend simultaneously, at different degrees. This is hard for most people to understand. You are so right. Theorists who talk about financial or social tipping points think the market or society is going in one trend and then reaches some point at which it “tips” in the other direction, as if it were a tree leaning over and finally falling due to one last wind gust. But the market is a fractal. It is changing direction every split second. Is every one of those changes a tipping point? People who reason from mechanics take some major trend change as an example of the point that “tipped.” But doing so is selective, because at smaller degrees the market had multiple other trend changes. And there are larger ones as well. Once you see it graphically, it’s pretty clear. The market and the social mood behind it move according to the Wave Principle. It’s not mechanics. Are you saying that social mood is completely endogenous? That nothing, no matter how wonderful or calamitous, has any effect on it at all? We have investigated every exogenous-cause argument we have heard, and we have tested every socionomic cause-and-result claim that we can think of. Usually they are two sides of a coin, and the established theory fails, and ours works. Now, we have yet to demonstrate all our conclusions with rigorous statistics. We recently published a paper about political forecasting. But I will also say that we have found no papers that prove exogenous causality in the stock market. The theory is simply assumed, as if it were a law of physics. And that’s exactly what it is, which is why it doesn’t apply to social behavior. I would welcome any challenge to socionomics that someone thinks we may have overlooked. If I accept, as you say, that mood drives events, I then have to ask this: What drives mood? Social mood arises when humans interact socially. It is not passed from one person to another as in contagion. It is not imparted by leaders. It is not imposed by authorities. 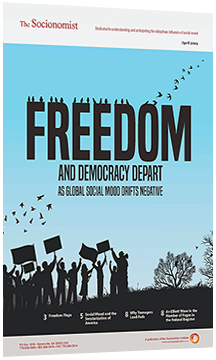 If anything “drives” the emergence of social mood, it is the herding impulse. At least the process seems closely related to the herding impulse. How exactly do herding impulses interact in a group setting? We don’t know. Maybe someone well-versed in fMRI studies can figure it out. What role do Elliott waves play? Elliott waves describe the fluctuations of social mood, just as branching rules describe the pattern of trees. Elliott waves probably constrain social mood fluctuations, just as branching rules constrain branching systems. Meaning that social mood does not move outside the form of an Elliott wave? You have written about Fibonacci relationships, golden spirals and so on in the natural world and noted that those same growth principles turn up in human behavior. Do you have a theory connecting physical manifestations in nature and social manifestations in groups? Many living systems display Fibonacci relationships. So do Elliott waves, which describe a living system. A special type of fractal is found in living beings and systems. I call it a robust fractal. Most fractals in non-living nature are indefinite, or random, fractals, and a few are self-identical fractals. Clouds and seacoasts are indefinite fractals. Heated silicone oil produces a self-identical fractal of stacked hexagonal patterns. Robust fractals do have a specific pattern, but they do not repeat it exactly; there are quantitative differences; a robust fractal is self-similar but not self-identical. Trees, circulatory systems and pulmonary systems are all robust fractals. The small branches look a lot like the larger ones but not exactly like them. That’s how component waves look relative to encompassing waves. Are you also saying that there absolutely is never a case in which an event drives the markets? Not quite. Transitory emotional reactions move prices occasionally for a few seconds or minutes. The market quickly adjusts to where it would have been without the disturbance. Larger trends are completely independent of exogenous cause. Now recall my observation that people remember their emotions. This is a big reason why people think that news moves markets. They remember the big up opening on news, or the sharp one-minute reaction. But they cannot consciously register the unconscious mood that guided the vast bulk of the market’s moves. They do not sense the causality, so they don’t remember it. Where do you see the science heading next? We need to test all of our ideas rigorously. We are doing so little by little. The Socionomics Foundation offers grants to interested academics. What is your biggest dream for socionomics? I would like to see departments of socionomics in universities. The demand is growing, and some professors are teaching socionomics courses. So it is beginning to happen. Will you see it in your lifetime? It depends on how long I live!